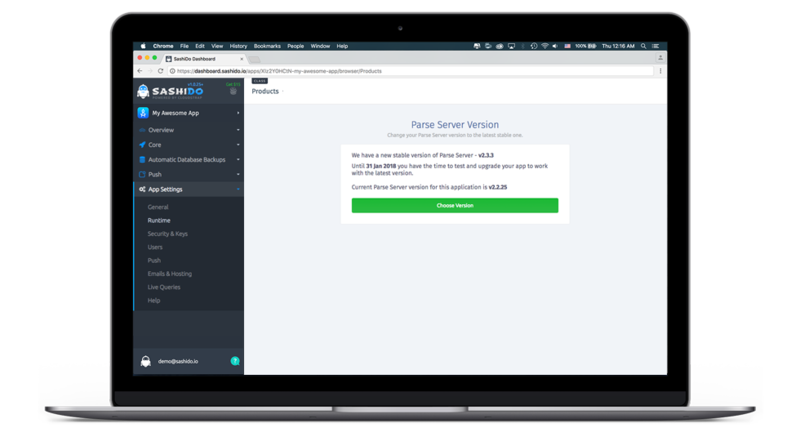 Today, we are pleased to announce that we have just released a new stable version of Parse Server - 2.3.3. This is a major release containing new features and bugfixes, and continues our focus on making your experience with SashiDo faster and easier. Here you can find details on what this specific release includes from the official Parse Server GitHub page. You are probably wondering how you can change the version! It is pretty simple actually. All you need to do is log into your app’s dashboard and navigate to the App settings section. Once there you will see “Runtimes”- just click on it and you can proceed with the version change. The current stable version of Parse Server v2.2.25 will be discontinued on January 31st, 2018 so we highly recommend you to test the newer version with your app and make sure everything works as expected before this date. What we can suggest you is to switch to v2.3.3 on your dev application first and do some tests to ensure that your code works correctly. Just have in mind that when changing the version, your app will be re-built and re-deployed so give it a couple of minutes before accessing it through the dashboard again. On January 31st we will remove the older 2.2.25 version, so in case you haven’t switched your apps to v2.3.3 until this date, the system will do it automatically. With Parse Server v2.3.3 we are also releasing something that we have been working on lately and we are thrilled to share with you - our brand new Push Notifications service. If you have sent push notifications with Parse Server you are probably familiar with the issues that come with having larger audience. We wanted to address these issues and created an external service that can handle your demands. Our goal was to be able to send push notifications as quickly as possible, perform well under high loads, be able to scale each component of the system according to the demand and last but not least stick to our “No vendor lock-in” policy. 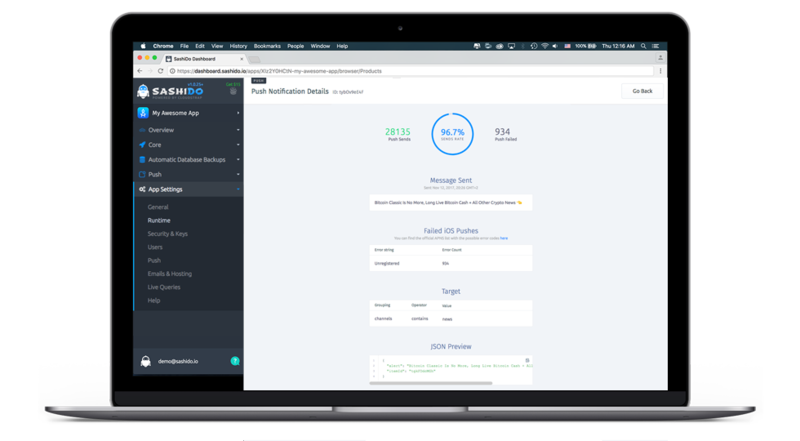 After switching to the new Push Notifications service, which is enabled by default with Parse Server v2.3.3 and above on SashiDo, you will be able send push notifications to your clients about 20 times faster than before, without pushing the limits of your Parse Server and slowing down other requests. You will also no longer need to worry about restarts, crashes or deployments. Isn’t that cool? Why are my push notifications failing? Additionally we made some improvements in the Dashboard regarding the status of the push notifications. Up until this point, when there were failed push notifications, the only provided information was how many had actually failed. Now, you can see the specific errors that were returned by Apple and/or Google's services. We remain at your disposal in case questions pop up, so do not hesitate to reach us back any time.